Cover off your client ‘thank-yous’ and make the most of this glittering opportunity with our quick Christmas marketing ideas. Somehow it’s that time of year. Again. Already! Slight issue: October through December is an extremely busy period for many businesses. When you’re in the thick of it, frantically trying to get everything done by Christmas, Christmas marketing for your own business can fall by the wayside. The path of least resistance can be to simply ‘do what we did last year’ or – gasp ­– ‘forget’ to extend Christmas wishes to your clients. Tempting as it may be to ignore the festive season when you’re buried under a mountain of work, Christmas marketing is actually a golden opportunity. It’s a chance to not only thank your valued clients for their ongoing support, but also to reinforce your company values and remind people why they do business with you. A lovely email full of good cheer and gratitude is one of the simplest, most cost-effective tools in the Christmas marketing repertoire. Really, there’s no excuse for not doing this at a minimum. Platforms like MailChimp make EDMs highly accessible, inexpensive and measurable (you can tell who opened your email!). The trick is to be festive with your design and meaningful with your wording. Make it fun because it’s a celebratory time of year and try to deliver the message in your company tone of voice instead of a generic ‘Merry Christmas and Happy New Year’ (Zzzzzzzz). If your office will be closed over Christmas, you can take this opportunity to give your clients a heads-up about dates. One caveat to this suggestion is that a branded EDM alone won’t cut it for high-value clients. They deserve better, wouldn’t you agree? 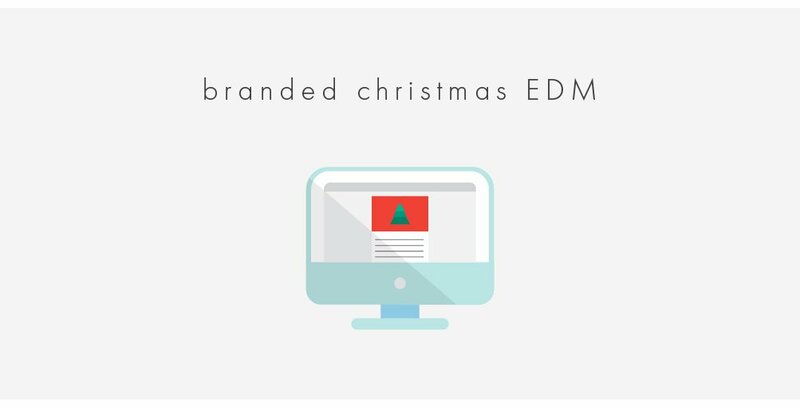 A natural progression from the branded EDM is a branded Christmas card sent by post. This option is a shade more personal and tangible than an EDM, and requires a little more effort on your part (but not a lot). We recommend you get one designed professionally and tailor it to your company’s culture and the industry you work in. Depending on how many staff you have, you could ask everyone who works with that client to write a personal message and sign their name. The extra time it takes is well worth it. Christmas marketing for retail and e-commerce businesses that don’t have personal interactions with clients is a little different from professional services. These businesses with a large, somewhat faceless client base could consider creating a seasonal special offer or discount. This will have the dual benefit of making your clients feel valued and increasing sales and revenue. So if you feel that 20% off is the best way to show customers you care, go for it! There’s been a lot of talk lately about excessive consumption and how we all panic-buy throwaway items at Christmas that no one wants, much less needs. No way should your Christmas marketing efforts add to the world’s waste. As we all know, Christmas is about being grateful for the year that’s passed, celebrating our achievements, being with loved ones and practising unabashed kindness. Embrace the true spirit of Christmas by giving generously to a cause you believe in on behalf of your clients. Organisations such as Oxfam, The Smith Family and Unicef (just to name a few) offer wonderful Christmas gift giving options that can save lives. If your company is considering going down the branded merchandise path, invest in practical, non-perishable options that won’t be thrown away or consumed straightaway. Items like notepads, tote bags, umbrellas, calendars, re-usable coffee cups, speakers, chargers and candles have real staying power. There’s still time to make the most of your Christmas marketing with strategy, design and copywriting assistance from Sketch Corp.